Today we will be taking a look at popular red Commander foils that are criminally underpriced. I have been tinkering with the new Daretti, Scrap Savant deck which was an absolute blast to play with, and has about the best combination of Vorthos appeal to me Wizards could ever conjure up in a deck. I have an affinity for artifact decks and I love dragons but I never once imagined the day where a preconstructed deck would combine my favorite kind of deck with my favorite creature type. Thank you Wizards. So I spent the last week or so looking for cards to bolster my Daretti deck, and at the same time kept an eye out for any potential foil Commander specs in red. It is blasphemy not to run Blasphemous Act in your red Commander decks. The price of foil copies of Blasphemous Act in relation to the amount of play the card sees in Commander is sacrilegious. Blasphemous Act is the third most played red card in scoeri’s database of most popular cards in Commander (compiled from all the Commander decklists posted or updated on mtgsalvation.com within the previous 365 days), and was also highlighted as a Commander staple in other lists of Commander staples here and here. Blasphemous Act is the best red sweeper in Commander, in terms of damage to mana cost ratio. While most red sweepers scale in damage with the amount of mana spent to cast it, in Commander games Blasphemous Act is often a one mana spell that deals thirteen damage to everything, taking out even Eldrazis (at least those that are legal). 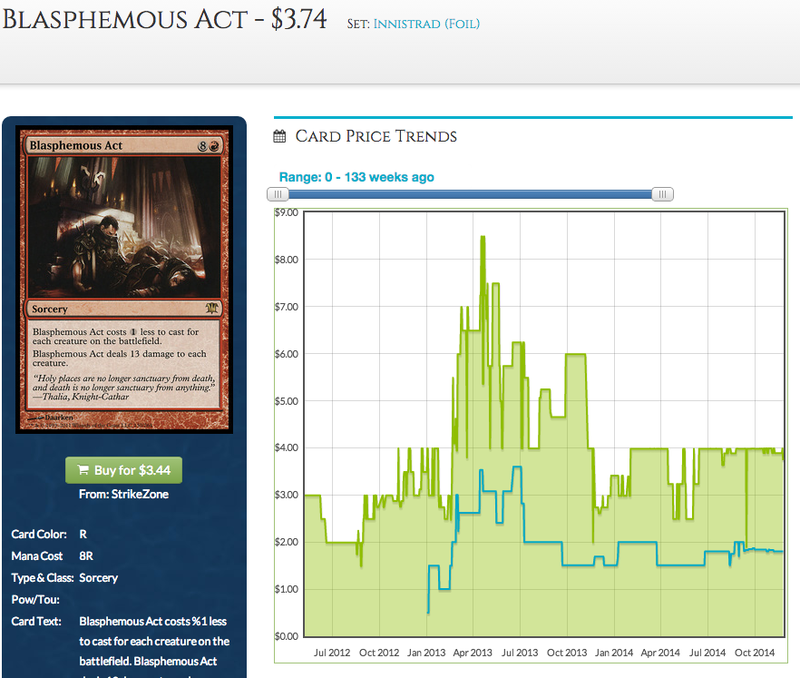 I am fairly surprised to find foil Blasphemous Acts sitting at just $3.74, with a stagnant price since the beginning of this year. 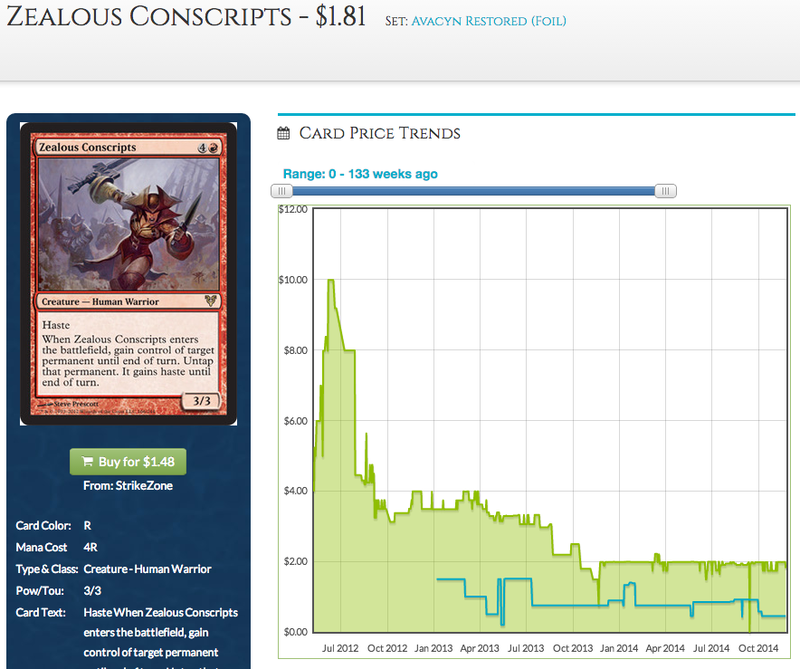 Non-foil copies dipped in price slightly when Blasphemous Act was reprinted in the Commander 2014 Daretti deck, but the price of foil copies remained static. Blasphemous Act is a very flavorful card and is not easy to fit into any block set. It could be included in Modern Masters II where there would be foil reprints, but I doubt Wizards would want to spend a rare slot on a card that was just reprinted in a supplemental product. Even if Blasphemous Act is in Modern Masters II and they significantly increase the print run of Modern Masters II compared to that of Modern Masters, the set will probably still be a limited print run product and I doubt that will tank the price of foil Blasphemous Acts by a large margin, if any at all. At $3.74, I am bullish on foil copies of the best red board wipe in Commander. Red has always been weak in the card selection and advantage department, which explains why some of the most popular red cards in Commander are Windfall-style cards. Reforge your hand together with your soul. Wheel of Fortune, the second most played red card in the list is a bit pricey, with the cheapest copy going for $20.80, but you can pick up foil copies of a functionally similar card at $5.43. Reforge the Soul has a near to nil chance of being reprinted in foil form with the highly polarised reception of the miracle mechanic. Furthermore, miracle cards have a special card frame, a point which I will return to in a bit. 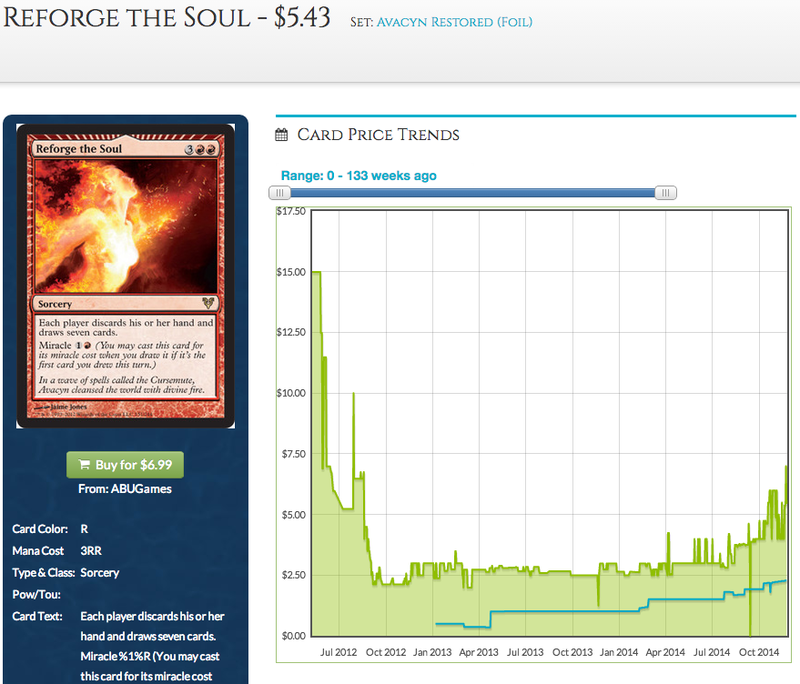 Reforge the Soul is currently the sixth most popular red card in Commander according to scoeri’s list. Cameras do not capture miracles well, the reason why miracles are hard to document. Tell me the foil miracle card above does not have a sweet, shiny border. 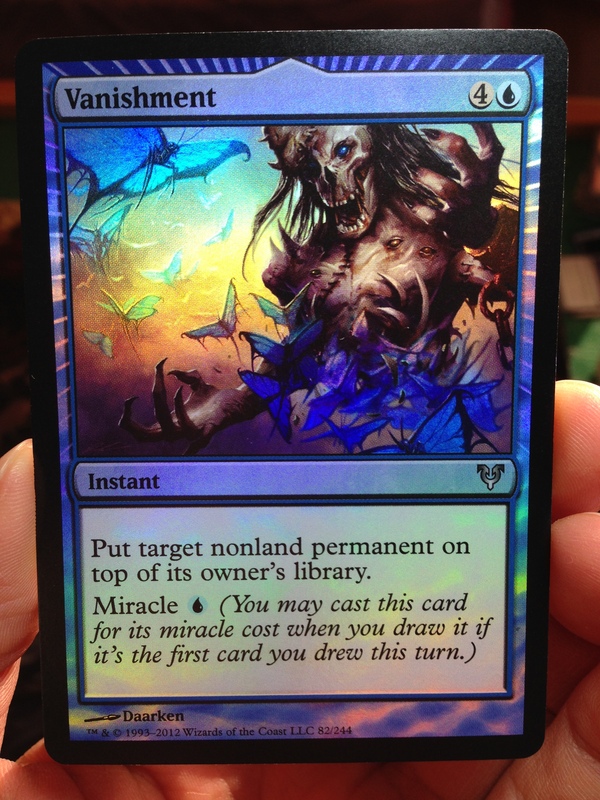 I think many would agree that the miracle border design brings out the shine in the foil. While aesthetic appeal is a subjective issue, collectibility can be roughly defined as being correlated with the rarity and uniqueness of a card. Magic is a trading card game, and a card’s collectibility affects its price. Reprints with different frames (pre-Eight Edition frame versus the Modern card frame) or art are valued differently and I have an inkling that Commander-playable cards with a miracle border would possess a higher collector’s appeal based on the merit of being printed with a border found only in Avacyn Restored. My argument is extremely speculative; discounting Judge Foil reprints in old borders, playable foils in miracle and Nyx-ified borders are relatively new and there has yet to be data to validate my point. It’s a food for thought though. One of the reason I play Commander is that besides the camaraderie and insanely fun interactions, the format allows me to indulge in my sadistic tendencies in a socially acceptable manner. Back when Commander 2013 was just released, my pet Commander deck was a griefer Bant build that abuses the power of Derevi, Empyrial Tactician. I did not made many friends in the local 1v1 Commander scene with that deck. Thankfully Derevi got banned in 1v1 Commander before I alienated the whole community. Vandalising Commander games since the fall of 2012. Cheat in a Mycosynth Lattice with Daretti’s second ability. Overload a Vandalblast for a one-sided Obliterate and the ultimate schadenfreude moment, combo courtesy of Reddit user smokedoor5. Destructive revelries aside, Vandalblast is the fifth most played red card in Commander as detailed by scoeri’s list above, and it is easy to see why: the power level of overload cards increase by magnitudes in Commander games. And they are asymmetrical, which is nice. Vandalblast also sees play as a two-of in the sideboard of Modern Blue Moon and UR-based decks as a flexible Shatterstorm. Foil price alert there. Check out the price for another popular Modern sideboard card from the same block. 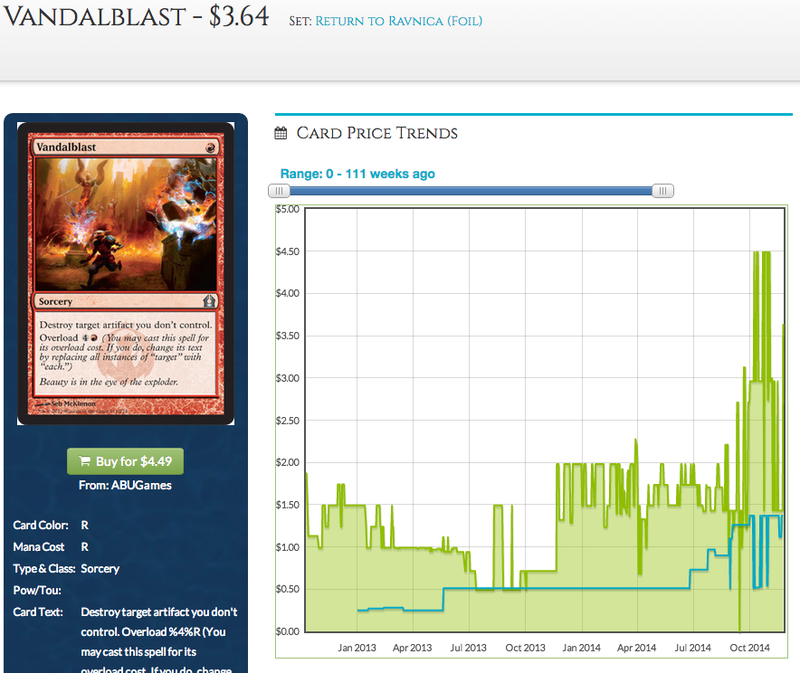 Foil Vandalblast is $3.64 as of writing, double its price from a month ago but if foil Wear//Tear broke $10, I am confident about the prospects of foil Vandalblast, which is a also a Commander staple on top of its Modern playability. Talking about Commander staples that are also played in Modern brings me to the next card, a creature whom I have lost countless Modern games to. Conscripted into your Kiki-Jiki combo. A Threaten on a pair of hasty legs, Zealous Conscripts is a decent Commander card on its own. However, the bulk of Zealous Conscripts’ popularity stemmed from the fact that Zealous Conscripts comprised the other half of the infinite combo with Kiki-Jiki, Mirror Breaker which is popular in both multiplayer and 1v1 Commander, and is the centerpiece of Modern Kiki Pod. Being the only mono-red creature that can go off with Kiki-Jiki, Zealous Conscripts’ popularity hinged on Kiki-Jiki, who is well-loved in Commander both as one of the ninety-nine or as a Commander for his ability to go to town on value and his ability to pull off infinite combos. Any deck that runs Kiki-Jiki would want to run Zealous Conscripts and vice versa. As of writing, Kiki-Jiki placed seventh on scoeri’s list of most played red cards in Commander, and Zealous Conscripts barely trailed the cloning goblin at ninth place. Being the foil rare in one of the Avacyn Restored preconstructed deck depressed the price tag of foil Zealous Conscripts. However, I highly doubt foil Zealous Conscripts would stay under $2 in the long term with the amount of play it is currently seeing. Judging from comments on Reddit and Twitter, the Daretti deck seemed to be very well received. Both Daretti and Feldon of the Third Path allow you to cheat-in creatures (and artifacts for Daretti) at well below their casting cost, an ability that is immensely popular with the Commander crowd. Daretti and Feldon’s popularity could equate to an influx in demand for Commander staples that fit into mono-red Commander decks, driving up the prices of currently undervalued red foil Commander staples. 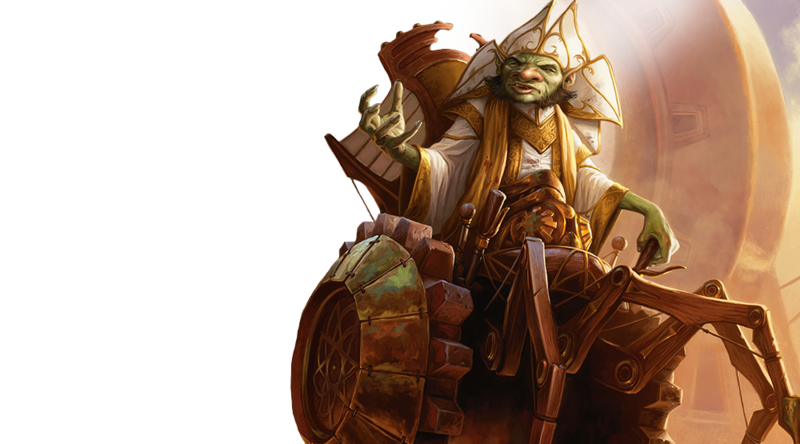 We are beginning to see the effect Daretti has on cards that fit into the deck: foils of Kudoltha Forgemaster, an artifact that fits perfectly in Daretti decks just spiked to $15 the day before this article is written and published. Krenko Mob Boss is also under the radar. He is! I would like to mention him too but unfortunately there’s only so much one can fit in an article. Foil Krenko has been slowly creeping up lately. Probably in no small part due to the fact that Return to Ravnica is still relatively fresh, having just rotated out of Standard. Did you just write this? I have already seen at least 2 articles saying the same things. Do point me towards those articles. I did my research for this article over the period of a week , and I am quite certain I have not encountered any finance articles mentioning Vandalblast. Guo, I’m really enjoying your articles! Keep up the good work. I like that you’re bringing more awareness to the potential of foils, especially in light of Wizards spewing out reprint after reprint. Also, nice to see you are on the foil train too. Just for the point out, foil zealous conscripts came from an intro pack, so they’re probably a higher quantity than some other foils mentioned. Still think it’s a good spec though. Yup, I did pointed that out in my article. I totally agree with you, foil Zealous Conscripts is still a good spec regardless.